Robert Cook was in the 1928 British Olympic wrestling team. He went on to become a professional wrestler, "A rough tough wrestler, with plenty of ability," according to historian Mike Hallinan. Our second Cook is Robert's grandson, Tim. Tim Cook tells the story of his own Olympic goal, to follow the footsteps of his famous grandfather. In April, 2012, I decided to discover more about my grandfather's wrestling career, despite only knowing that he had represented GB at the 1928 Olympics in Amsterdam. Fortunately I was put in contact with Allan Best at the BWA archives, and he rapidly increased my small collection of memorabilia and pictures. However he had gaps in his records and so it became necessary to search wider afield. Suddenly I was spending upwards of forty hours a week searching on the internet, contacting people in places such as France and Holland (thank God for Google translator) trying to find out about his international career. It was amazing to find that there is so little centrally documented evidence of the amateur/professional wrestlers of the early 1900s, despite a wealth of information on them surviving in newspaper archives, or with specialist collectors/websites. After learning a great deal I decided to take a trip to Amsterdam to take in the experience of the recently restored Olympic Stadium (and museum). My brother and I made our way to Holland (from Norway and Sweden respectively) arriving on 27th July, and prepared ourselves to celebrate the 84th anniversary of the opening ceremony on Saturday 28th. We walked the five kilometres to the Stadium from our hotel (nearer ten after getting lost), and saw the real Amsterdam on the way. It is a friendly and very pretty city away from the infamous tourist attractions, a real gem that I would suggest anyone make the effort to visit. Arriving at the Olympische Stadion at 1:50pm, it was occupied by excited children undertaking a specially organised Olympic challenge. However at 2pm, the exact time the team procession had begun 84 years previously, it suddenly emptied and went quiet. Standing there on the running track it seemed smaller than I expected, minute in comparison to the Olympic stadium in London. The art deco friezes and 1930s construction provided a glimpse of what our grandfather and his team mates must have seen (without the 30,000 plus crowd), and for the first time I began to feel a real connection with him. I won’t lie and say that I didn’t get goose bumps, or feel emotional standing there. I did. I had never known much about wrestling before this journey; it was always boxing for me. However that has changed for me now, the dedication and skill required to wrestle, to physically dominate and out-perform another human being in an intelligent manner is far more impressive. Back home in rainy Norway I now want to dedicate some time to ensuring that the likes of Harold Sansum, Harold Angus, George MacKenzie, Robert Cook, Sam Rabin and Bernard Rowe (and others) are not forgotten. I will just mention that in this day and age sites such as Wrestling Heritage are capable of ensuring that they are not, and should be thanked for the dedication they display in doing what they do. I never met my grandfather, but through some very special individuals I have got to know him a lot better. Robert's grandson, Tim, continues to research his grandfather. His story is told in Tim's Olympic Goal, and anyone with information about Robert can contact Tim through our usual email address. 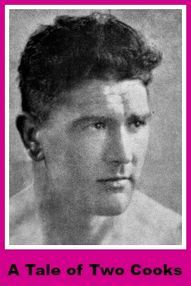 Robert Cook was born on 3rd October, 1905 and is another of the pioneers of wrestling whose professional career continued into the early 1950s. Putting aside his pioneering career in the 1930s it was in the amateur code of wrestling that Robert Cook initially excelled. His interest in wrestling was cemented when he joined the Ashdown Club, where he met some of the top amateurs of the day: Atholl Oakley, George MacKenzie, Bert Assirati, Bill Garnon and Sam Rabin. (The photo above shows an upright Robert at the Ashdown Club). Robert was a porter at Smithfield Market and in 1927 with few opportunities for professional wrestling in Britain he had no aspirations of making money from the sport. 1927 was a successful year, with Robert winning the British lightweight championship. This was only the start, with more British championship success to follow as British champion at welterweight and middleweight the following year and selection for the Olympic Games. In 1928 Robert represented Great Britain in the freestyle welterweight division at the Olympic Games which were held in Amsterdam. With an unfortunate draw he was finally placed fifth of the eleven competitors, losing to the eventual silver and bronze medal winners, Lloyd Appleton of the United States of America and Maurice Letchford of Canada. In 1931 many of Robert's contemporaries at the Ashdown were turning professional as the all-in style started to gain a hold. Oakeley, Assirati and Garnon were establishing themselves as national figures on the rapidly developing pro circuit. Oakeley was also making his way as a promoter, and persuaded Robert to turn professional. It was the beginning of a new career. Professional wrestling was flourishing in the early 1930s and skilled in both the freestyle and Catch as Catch Can styles of wrestling, Robert was well placed to make a success. Although he never became a household name like Jack Pye, Norman the Butcher or Bert Assirati; Robert Cook was a man who gained the respect of other wrestlers and admiration of those at ringside. The names of his opponents are indicative of his calibre: Richard Willis, George Boganski, Mario Magisti and Bert Assirati. By 1937 Robert Cook was widely recognised as British and European Light Heavyweight Champion. The precise lineage of the championship belt is unclear, but we have seen unconfirmed reports of Robert winning the British championship at Belle Vue on 8th May 1936. 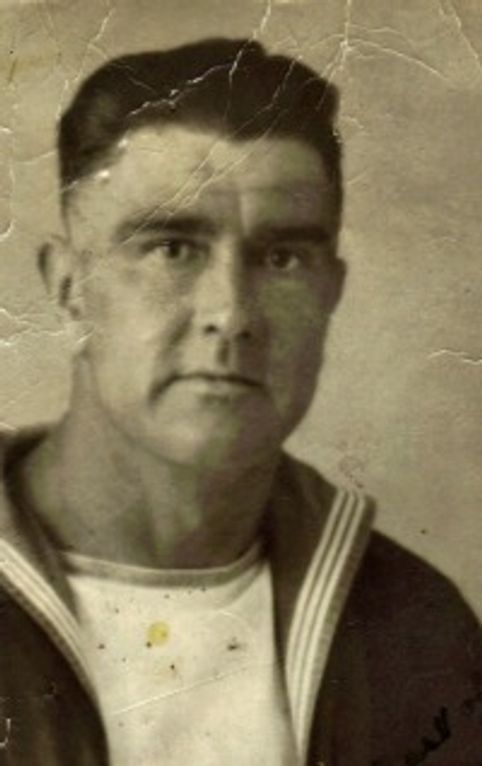 Wartime Britain saw Robert serving in the Navy as chief stoker on board HMS Empire and Sefton. Following the second world war Atholl Oakeley resumed his attempt to re-establish wrestling in the face of the relenting competition from the new Mountevans style rules. 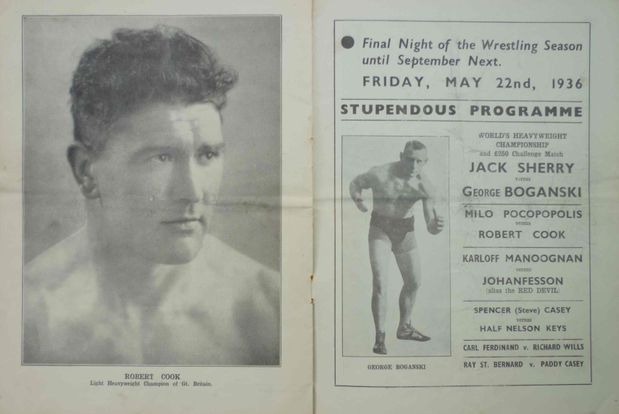 He turned to established wrestlers such as Robert Cook, with our final recorded match at Harringay Stadium on 7th March, 1950, defeating Yugoslavian Sandor Schlosser in 28 minutes. Robert Cook died of cancer in 1963.